As I come down to hotel lobby, my watch shows just 5 ‘O’ clock in the morning. However, my trip coordinator, Mr. Bunla is already waiting for me. I get into the car and we speed towards Angkor Wat. Watching the Sun rise from behind this temple is the Reason for my departure at this unearthly time. While traveling, I remember that the Khmer language word ‘Wat’ has come from a similar Thai word, which means a temple. I note in my mind that both these words must have come from the Sanskrit word Watika. Angkor Wat therefor means a temple city. 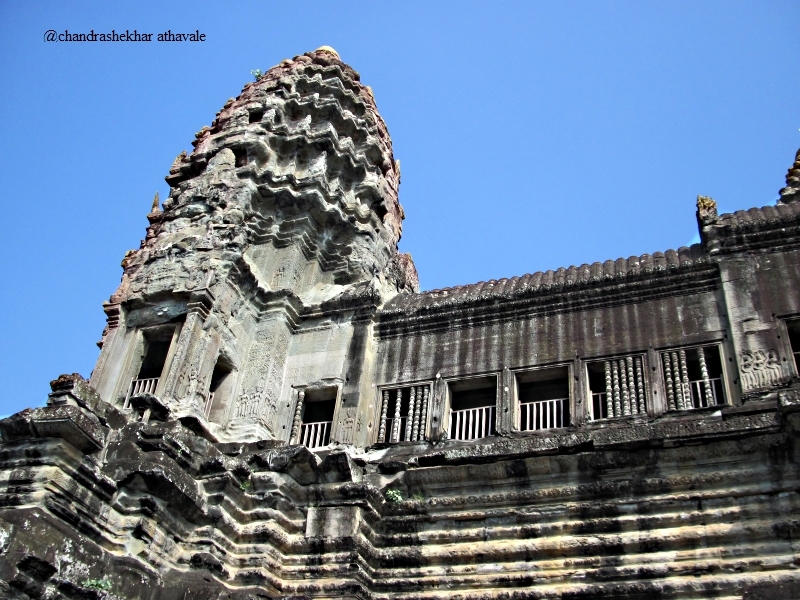 The construction of this temple was started during the reign of Khmer King Suryavarman II or during 1113-50. However, it seems that the construction work, which took 30 years to complete, was completed only after the demise of the king, as his after death title or name, ‘Paramavishnuloka’ appears in one of the bass reliefs on the first level. It is believed that the design of this temple was made by a Brahmin minister of the king, Divakar Pandit, who was believed to be endowed with divine powers. 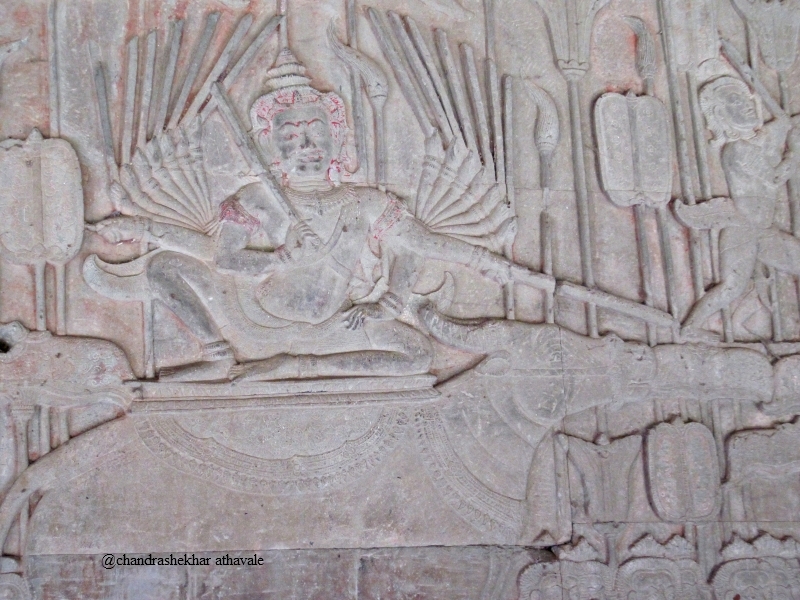 Cambodians however attribute the temple to Hindu mythological architect of the Gods, ‘Vishwakarma.’ There has been a considerable debate as to whether Angkor Wat was built as a temple for God Vishnu or a tomb for the king. 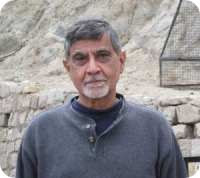 I think it is better to leave these debates to experts only. Such kind of thoughts raced through my mind, as my car came to a screeching halt in total darkness. Whatever light I could see, was from the headlights of a streaming line of cars, which brought visitors to the temple. I get down and look in the front. I see a huge stone pedestal with some steps and railing. I climb the steps in light of my flashlight and walk in the direction where everyone else is going. We are stopped by a human chain of security guards , who inform me that the temple opens at 5.30 A.M. There is nothing to do but wait and look into the darkness. I slowly realize that the pedestal was getting filled up with people. Most of them carried in their hands some or other kind of an expensive photographic apparatus produced by leading camera manufacturers of the world. I hide my modest camera in the palm of my hand and wait patiently. At exactly 5.30 A.M. the security guards break the human chain and allow the crowd to proceed. I prefer to wait on the pedestal, as I have been told that one of the best views of ‘Angkor Wat’ Sunrise can be seen from the very place I stand. In spite of so many people being around, only sound that I can hear is the faint rattle of a diesel engine driven pump. 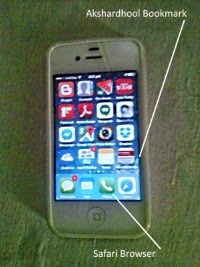 This is unusual because in India, whenever few people gather together, a virtual cacophony results almost immediately. After another 15 minutes, I sense some kind of black shadows far away on the background of a pitch dark bluish sky. Another few minutes gone, I can now see a huge moat of water just in front of me. This is the outer moat of Angkor temple. This one is about 200 meters wide and has a perimeter of about 5.5 Km. There is a wide causeway (12 meters or 39 feet wide) stretching in front of me for 250 meters. On other end of the causeway, I can now see a long brownish blackish line extending right up to the full breadth of my vision. 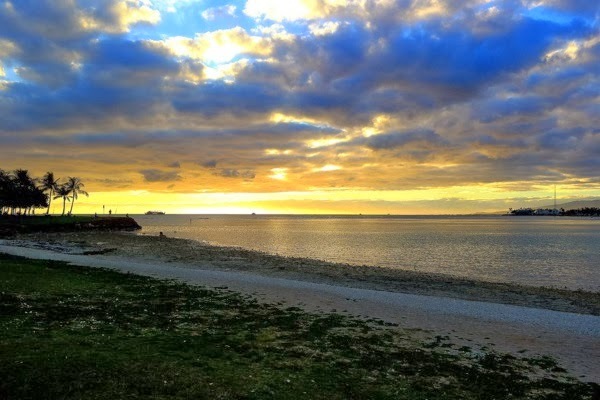 Sky takes a slightly lighter shade of dark blue. The brownish line turns out to be a long covered gallery with a row of square pillars in front. On my sides, two solid stone Lions stand guarding the way to the temple. I see now that the continuity of the gallery far ahead is broken at the middle and at some distance away from the middle on both sides, by three slightly damaged Gopuras, which stand tall. These Gopuras also serve as entry gates to the inner temple complex. As things light up, I can see that the gallery and the Gopuras, which I see in the front, are really just a facade for the temple. I see clearly far behind this facade, 5 tall peaks of the temple itself. The harmony, the balance, the proportions and the symmetry, everything is highly impressive. This view can be compared only to that of the Taj Mahal. No wonder that the locals believe that Angkor Wat was built by Gods themselves. I realize that I have no words to describe this colossal monument. Its already 6 ‘O’ clock in the morning. There is no rising Sun seen anywhere. The Sun rise was supposed to be at 5.54 A.M. Then I see that the horizon is completely covered with gray and dark gray clouds. 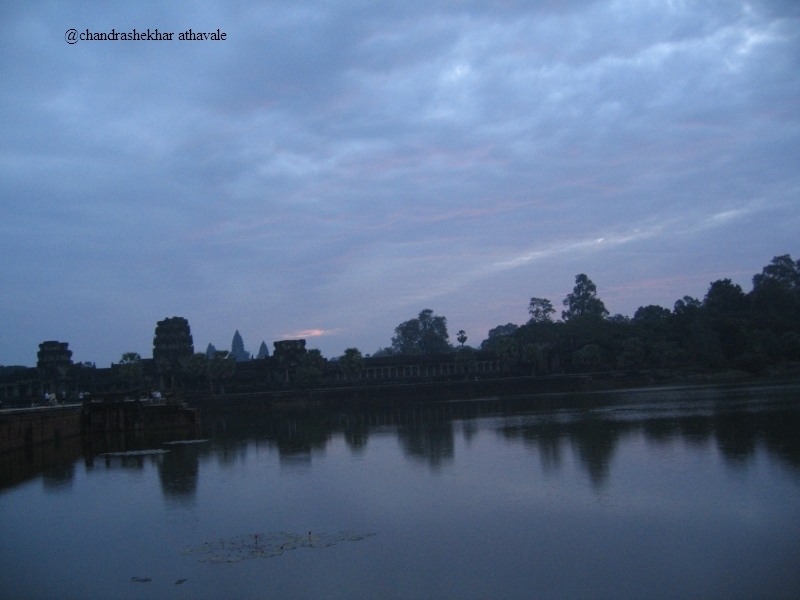 I would not be able to see the Sun rising from behind Angkor Wat. today. I only can see some brief pinkish orange streaks on the east horizon between the clouds. I give up and decide to go to my hotel to have a quick breakfast and then return here again to see this majestic creation of the Khmers. Famous English Author Somerset Maugham visited Angkor Wat in 1959. After his visit, he spoke to few people. His exact words were “ No one! 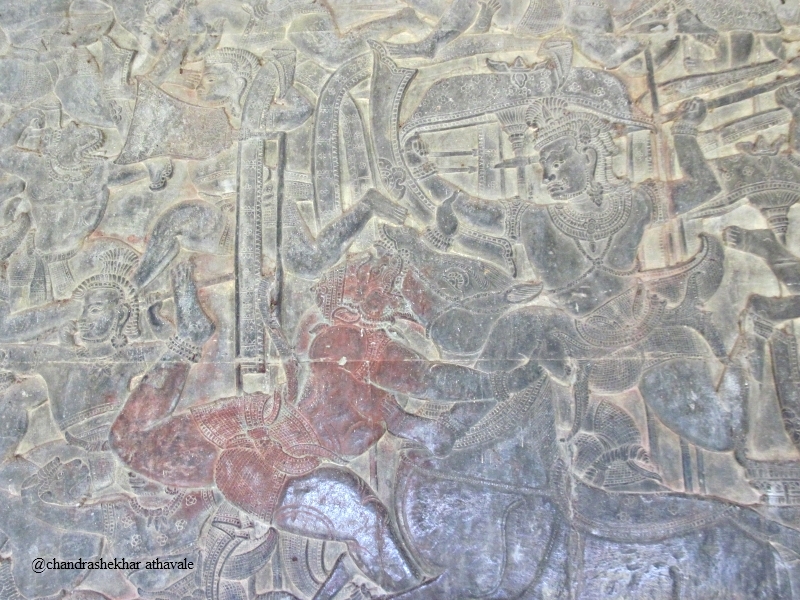 No one should die before they see Angkor”.Angkor Wat produces that kind of reaction in your mind. 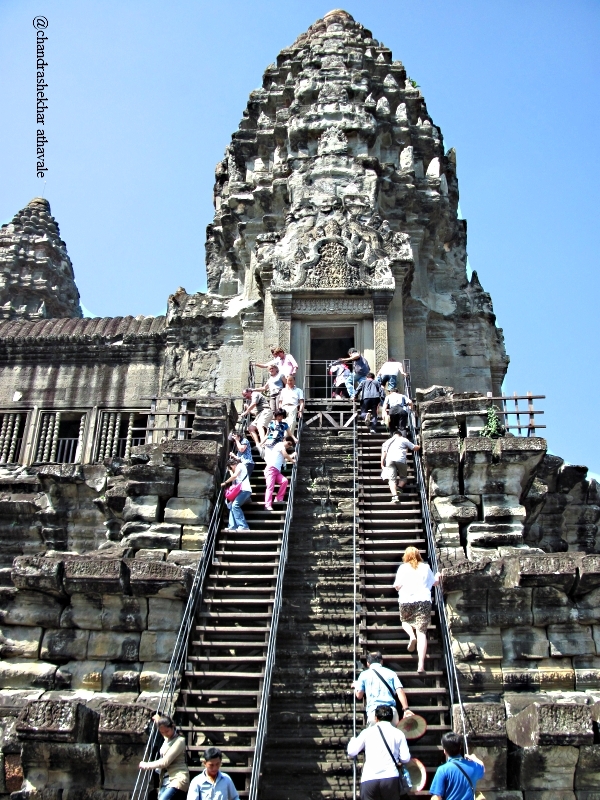 The layout of this temple is a symbolic representation of the world, as described in the Hindu scriptures. Five peaks at the center represent the peaks of Mount Meru. The outer wall represents the mountain ranges at the end of the world and the moat represents the water that is beyond the borders of the world, dark, unfathomable and unknown. I return to the temple after some hearty breakfast. I have to walk a lot today. 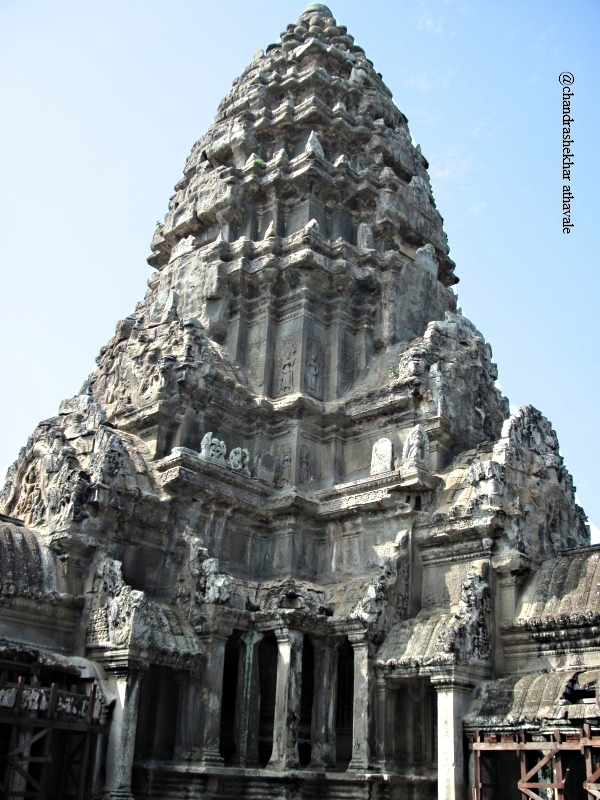 I cross the first causeway, climb few steps and enter the central Gopura of the facade. This facade is a narrow and very long structure. In front of me, I see another raised walkway supported by a low balustrade. This walkway is 350 meters long and is 9 meters wide. At the end of the walkway, I see now for the first time, the Inner temple of Angkor Wat. Instead of walking straight to the temple, I turn right and decide to explore the facade gallery. I see a huge standing figure of Buddha at some distance. I can see that there is something odd about this figure. The figure has eight hands, four on either side. This was originally an idol of the Hindu God Vishnu, with eight arms. 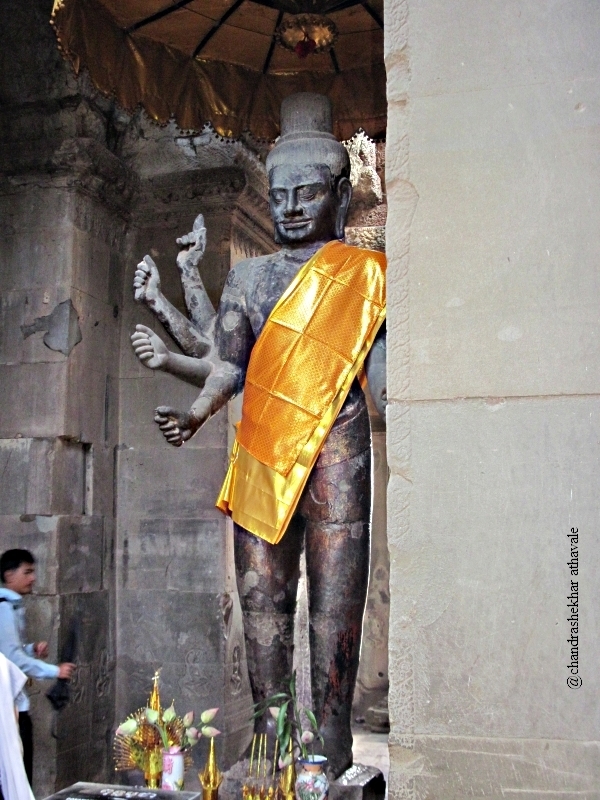 The head was replaced later to make him appear like Buddha. 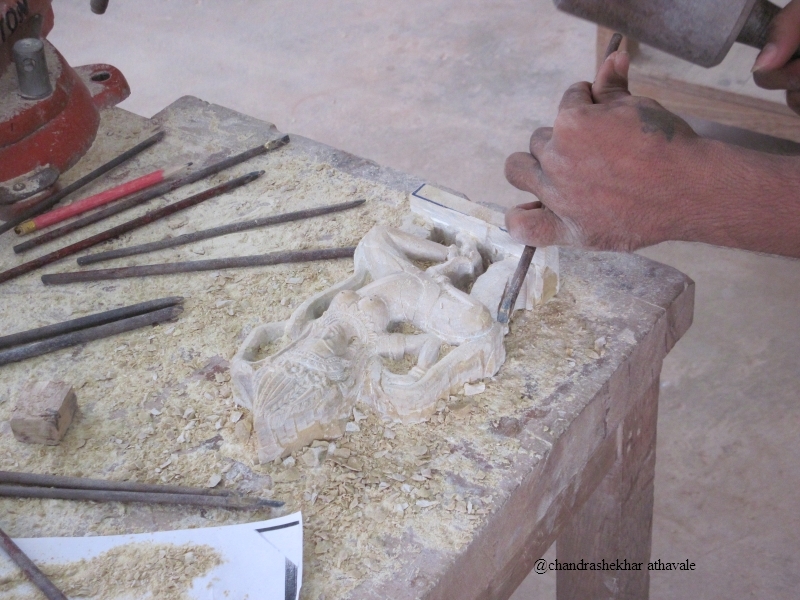 But the original carving of ornaments, garments and some golden colour can still be seen. I continue to walk along the gallery up to the end. There is a way provided to go round the facade and see the wall facing the temple. 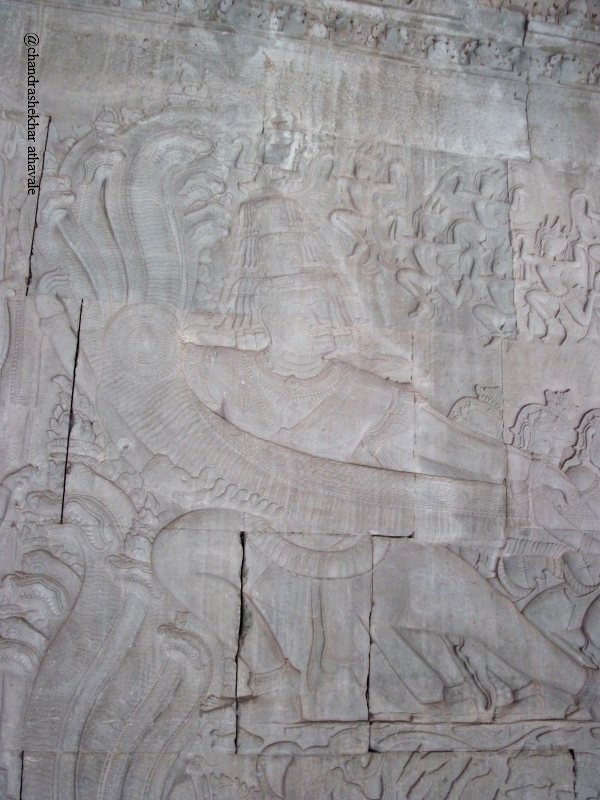 On this wall I can see some beautiful bass reliefs of Apsaras, Divine Nymphs from the heaven. I return to the central walkway and start for the inner temple. The main entrance is blocked due to some repair work being done and I use a diversion to enter the temple from another hall called Hall of Echos. 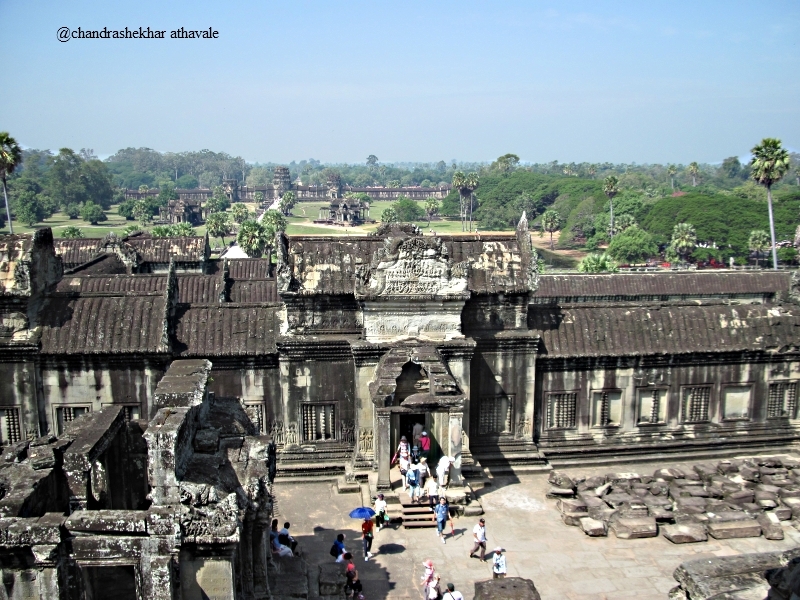 Angkor Wat has been built on 3 levels just like the Bayon temple. The first level Galleries are of a size 215 Meters by 187 meters. The second level, rises in the middle of first level and has a size of 100 Meters by 115 Meters. Standing tall at the center of the 2nd level, third level is of the size of 60 Meters by 60 Meters square. The central sanctuary raises above this level. Third level rises an astonishing 40 Meter above second level. The total height of the temple from ground is 65 Meters or213 feet. These numbers do non mean much on paper unless one actually starts climbing up. 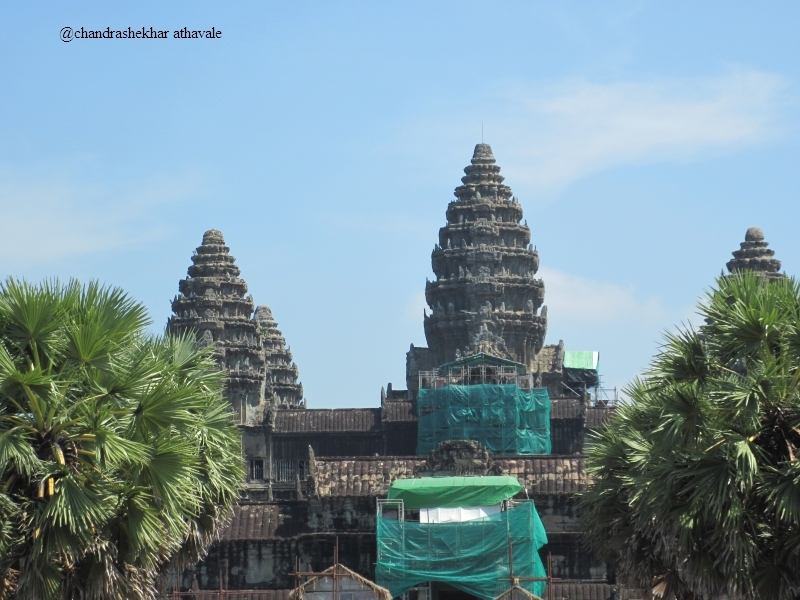 Obviously, since it was not possible for Khmer architects to construct a multistory structure, as requisite technology and materials were yet to be developed, they must have opted for this pyramid like temple mountain construction. I had read somewhere that there are two ways of visiting the temple. Level by level or go to the top first and then come down to the first level at the end. I choose the second alternative and start climbing the steps to second level. On my way up I can see beautiful carvings along the stair case. While climbing the steps, I can also see that the outer walls of the gallery on the second level are almost bare without any carvings. This indicates that perhaps bronze or silver panels were fixed on these walls from outside. This possibility is supported by number of holes seen in the outer walls, where wooden pegs might have been fixed to support the bronze panels. The steps finally lead me to the second level gallery walls, which face the third level structure. As I go round these inner walls, I can see that the walls and on the corners are carved with beautiful bass reliefs of Apsaras, the heavenly belles or celestial Nymphs with whom Gods live in the heaven. I wonder why repetitively such figures have been carved by the temple builders at this level. The figures may appear repetitive, but as I look closely, small and minute differences can be seen in each and every Apsara carving. The crowns, the necklaces, what the Apsaras hold in hand, differ in every frame. Some Apsaras appear single, some in groups of two and in few places, groups of four or five. 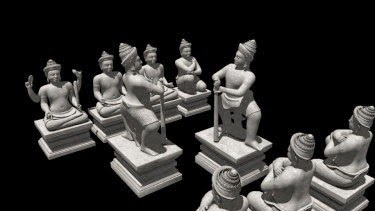 It is believed that the fascination of Khmer kings with Apsaras, really began with the concept of a God-King, directly acquired from India. 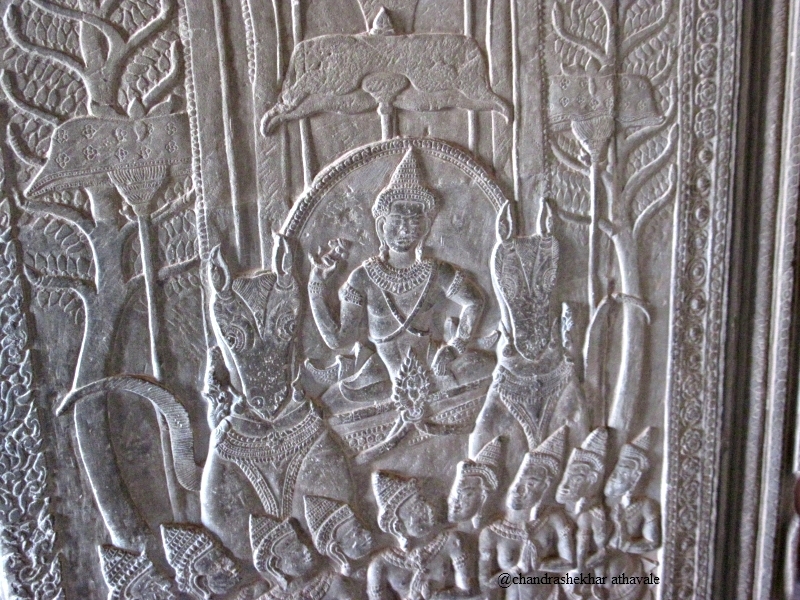 Khmer people believed like Indians of that period, that their Kings were incarnations of the Gods. 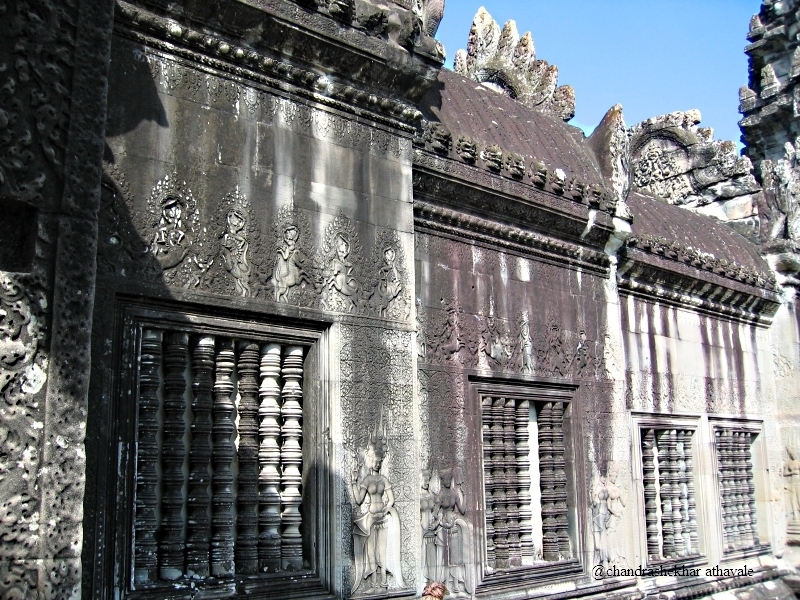 Since the Gods always had Apsaras associated with them, Khmer kings had Apsara carvings on the second level of the temple, where ordinary citizens were not allowed and also found justification in maintaining a large troupe of concubines. As I reach the eastern face of the gallery I see a tall flight of the wooden steps with steel railings provided for the visitors to go up to the third level. This arrangement pleases me and I decide to leave the Apsaras and go up to the third level. The third level does not have bass reliefs or carvings on the walls. An indication that these were covered with either Gold or Silver sheets. 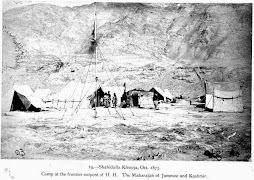 Only the King and his chief priest had the privilege of coming up to this level. The central sanctuary, soars 17 Meters above this level. I was surprised to find the central core of the sanctuary, where the statue of God Vishnu would have been, completely filled up and sealed with brickwork with four odd images of Buddha installed in four directions outside the brick walls. The French excavators, digging here, had found a central shaft about 27 Meters deep filled with a hoard of Gold objects down below. What I see here is just a solid brick wall. The view around from this level is exquisitely breath taking. 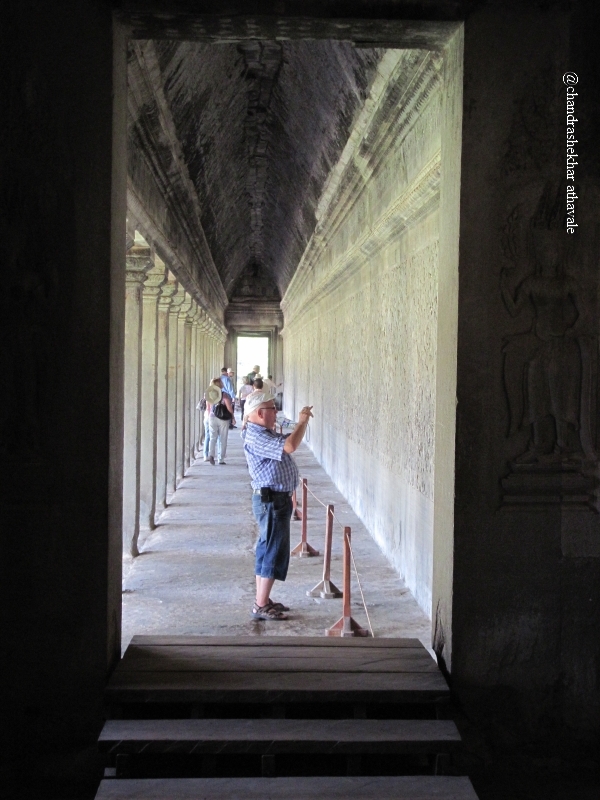 I start climbing down, pause briefly in the second level galleries to take a few shots, and soon reach the first level to see the main attraction of Angkor Wat, the bass reliefs on the external walls, all around the galleries. These galleries are huge. On East and West, they extend to a length of 215 meters and on North and South the length is 187 meters. 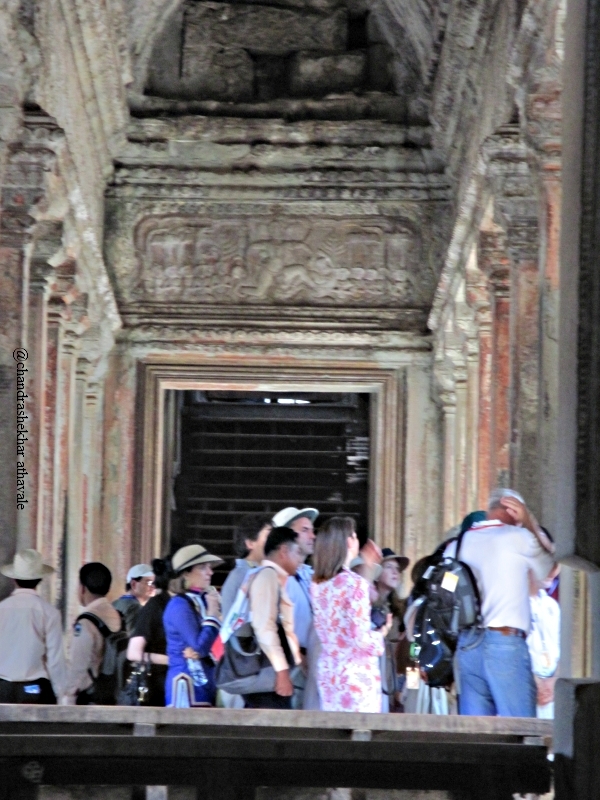 On each side, there is a central Gopura to enter the temple promenade. On either side of this central Gopura, the stone walls are engraved with superbly detailed pictorials, to the height of at least 3 meters. Just imagine a canvas for a picture 100 meters long and 3 meters wide. Gives an idea to the greatness of these bass reliefs, isn’t it? Surprisingly the story of each bass relief starts from the right and ends on the left. Something very unusual. 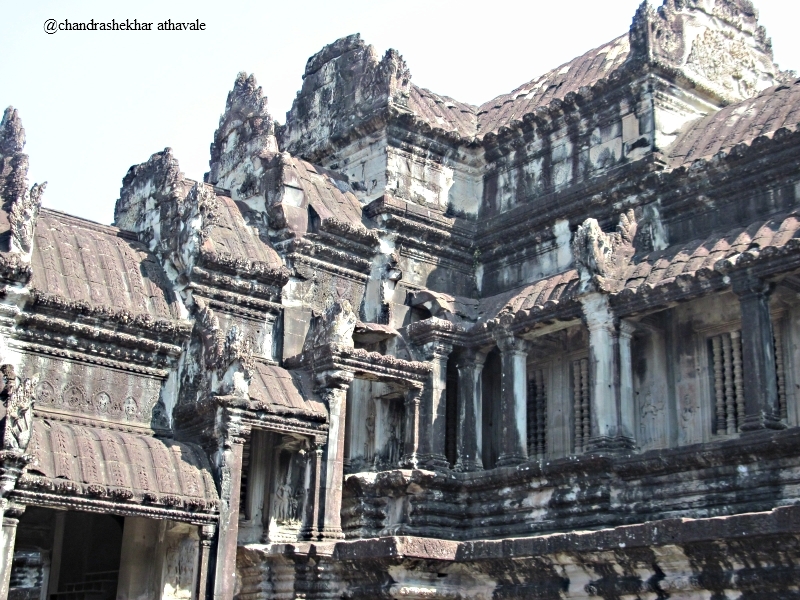 This is given as one of the reasons, by proponents of the theory that Angkor Wat temple was designed as a tomb. I only feel bit inconvenienced by this left handed arrangement. 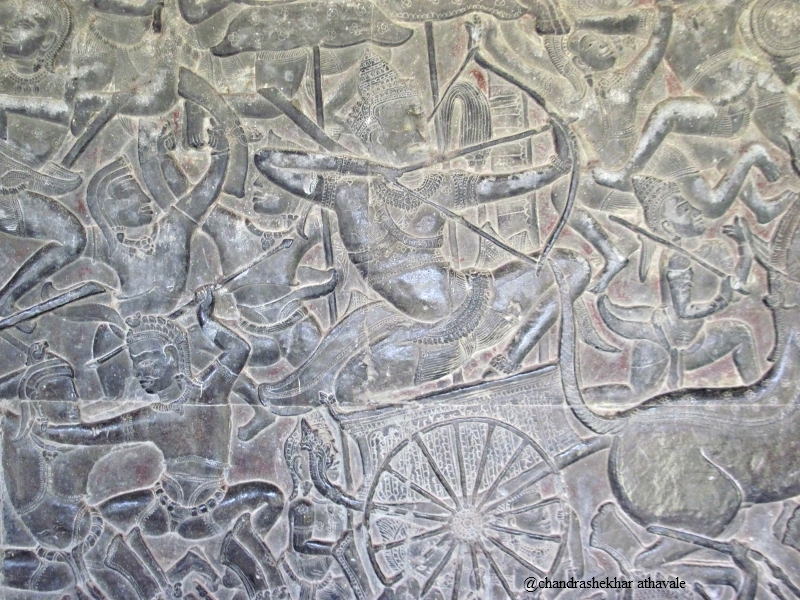 The bass relief on Southern part of the Gallery on the west shows the great war described in the Hindu Epic ‘Mahabharata’ . The war is shown in three levels, the foot soldiers on the lowest level, seniors commanders in the middle level and the princes and the kings on the top level. The detailing is so superb that I get a feeling of watching a real close and hand to hand battle going on in front of my eyes. 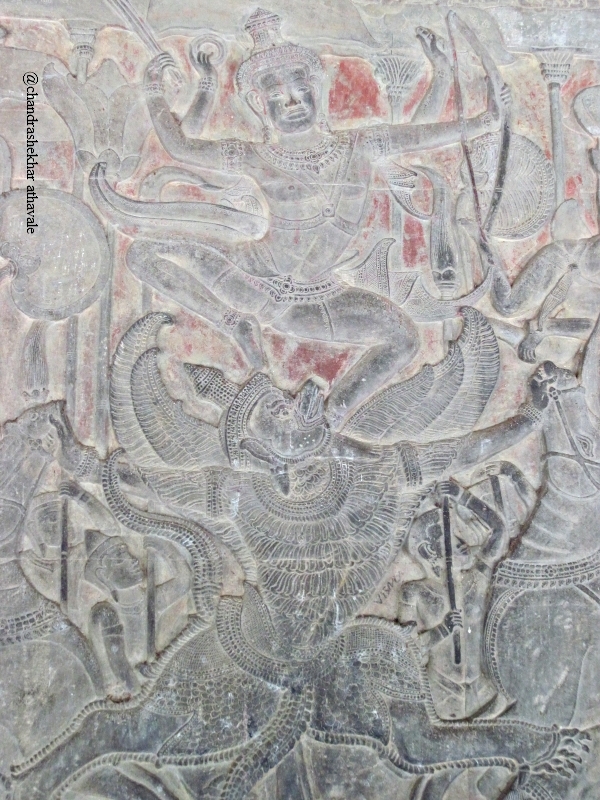 In the final scene, Prince Arjuna is ready to launch an arrow towards his Guru, Bheeshmacharya, who is lying on a bed of arrows, waiting to die. I walk further towards the southern gallery. 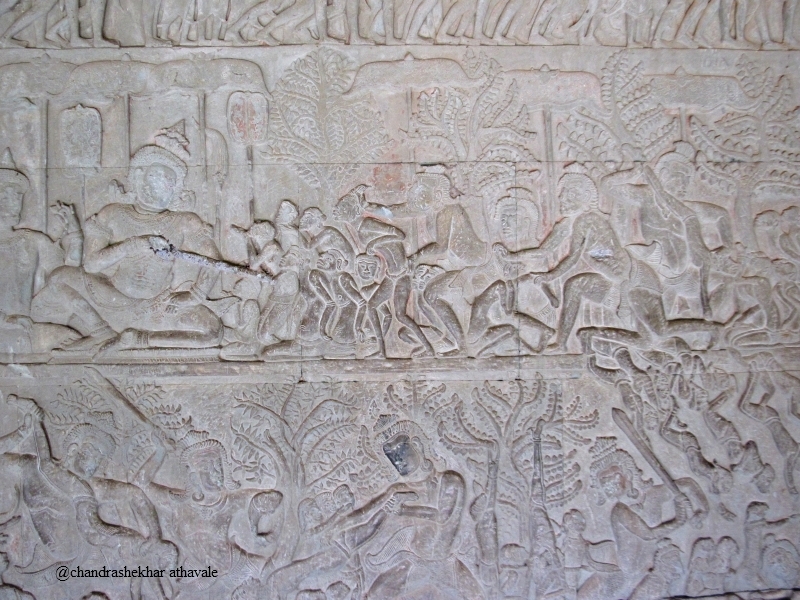 Here Khmer King Suryavarman II is shown leading his troops to combat. Later part of the bass relief has a very interesting story. 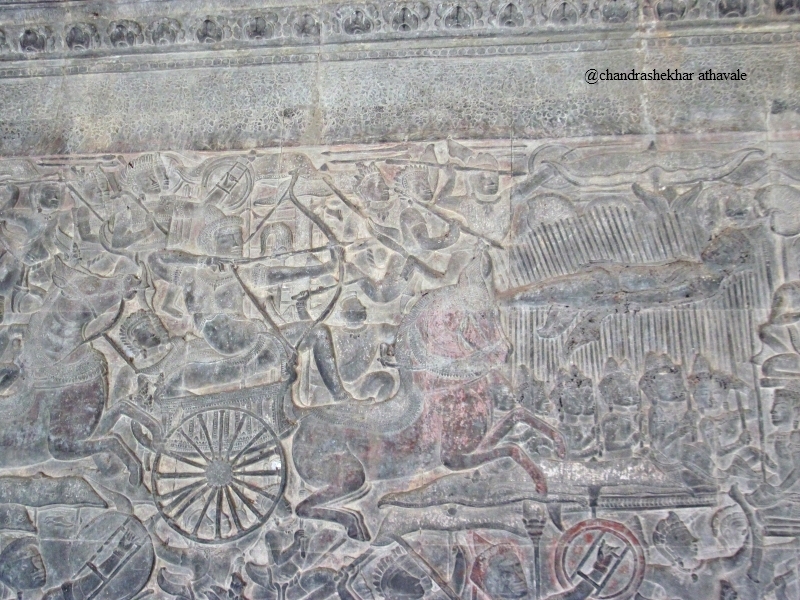 The Hindu God of death ‘Yama’ is shown here riding a bull water buffalo. He watches his assistant ‘Chitragupta’ taking a decision about sending dead souls either to heaven or hell and forcing the sinner souls with a stick through a trap door towards hell, which is depicted on the lower level of the bass relief with all tortures and punishments. The scene is just fantastic. 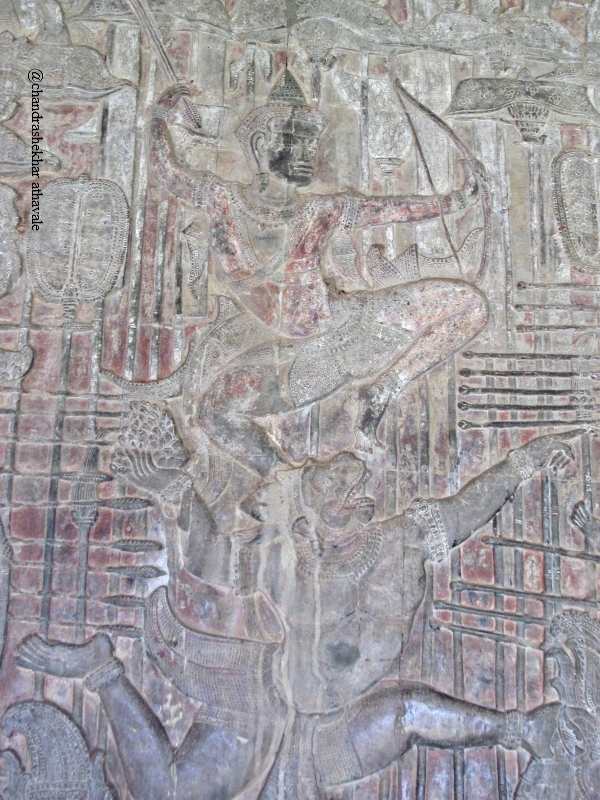 On the eastern gallery, full story of the churning of the cosmic sea by Gods and demons is pictured. Unfortunately except for one end, where God Shiva is braving the poison fumes of the five headed sea snake Vasuki, under strains of being used as a rope by the Gods and demons, rest of the bass relief is closed for repairs. I feel disappointed but walk on. 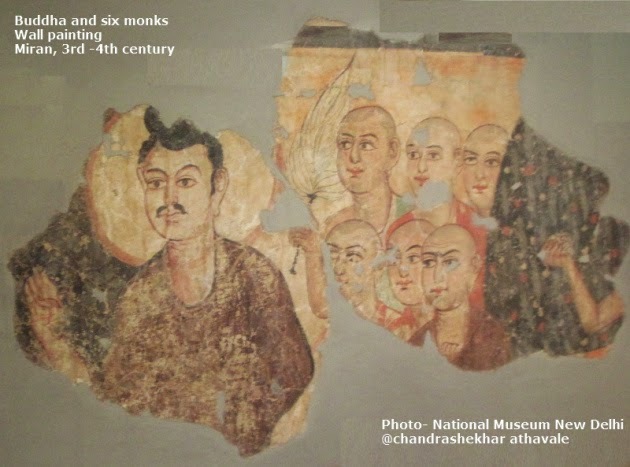 Further stories open up from Puranas and the epic Ramayana as I walk towards North gallery. I complete my circuit around the galleries. It is time to leave as my watch shows the time to be 1 P.M. I have spent close to 5 hours in this monument. I walk back along the walkways, turning around innumerable times, to get one last look of this colossus in stone. I decide to have for my lunch, genuine Khmer food. The dishes are cooked in coconut milk and I find them very tasty. One reason for this may be the similarity with Thai cooking, which anyway I love. For desert, I try some kind of sago porridge. 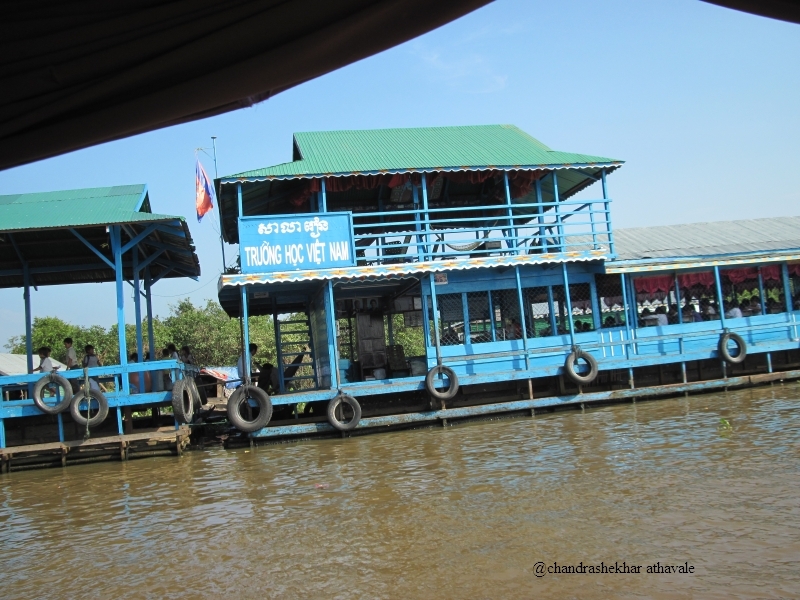 I am now on my way to see the greatest fresh water lake in South-East Asia, the Tonle Sap river. This river is quite unusual not because of its large basin but something else. This river joins the great Mekong river near Phnom Penh. For most of the time of the year, Tonle Sap carries water to Mekong. However during monsoon season, the quantity water in the Mekong river starts increasing as distant snows in Tibet start melting. 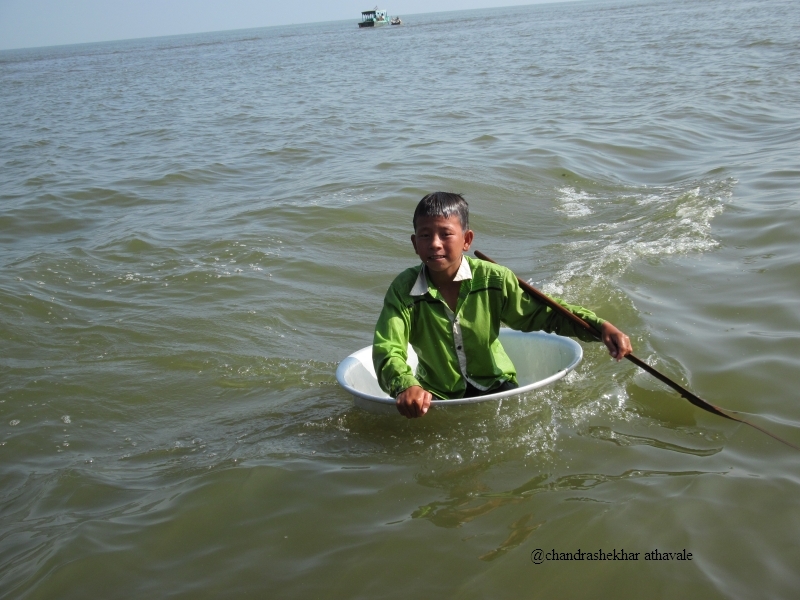 Mekong swells so much that sometime during month of October, waters of Tonle Sap stabilize and actually stop flowing. After this, the flow of water reverses suddenly and Mekong water starts flowing in Tonle Sap. This hydrological freak creates a huge fresh water lake in Tonle Sap river bed, where the water levels rise as much as 10 meters in this season. The reverse flow of water also bring enormous quantities of Fish to the Tonle Sap. For generations and generations, people of Cambodia have survived on this bounty of nature. I decide to take a boat ride, which turns out to be quite interesting, as I can see number of floating villages, complete with schools shops and religious places on my way. 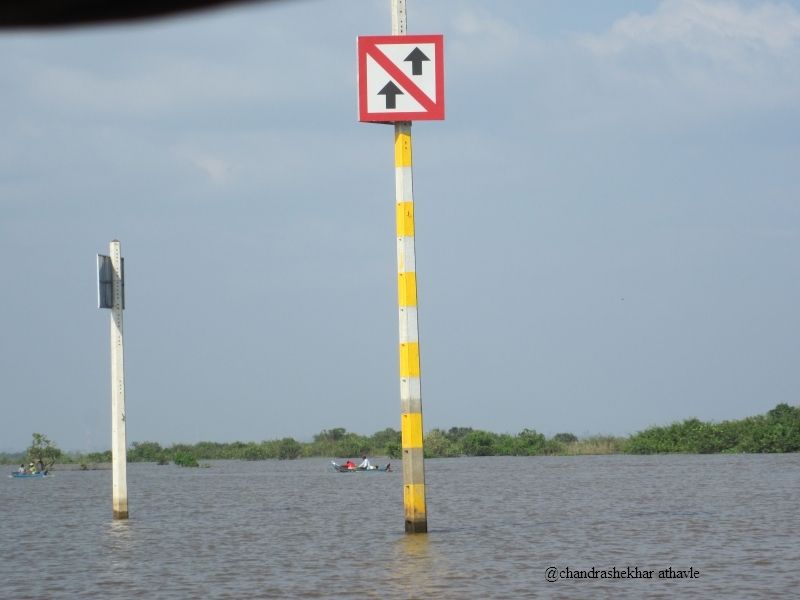 While riding the boat, I also see an amusing sign-post right in the middle of the river that says ‘One Way’. All of us see these road signs every now and then on the streets. But, this sign-post, standing in middle of the river, giving exactly the same message, appears rather strange to me. On way back, I visit a school, run by the Ministry of education, to teach budding artists in arts and crafts of Cambodia. Its fun to watch those artists work on wood , sandstone and silk to create beautiful little masterpieces, which can find their place in our living rooms. In the evening I go and watch a ballet performance. This is commonly knows as Apsara dance in Siem Reap. This form of classical dance had a long history. 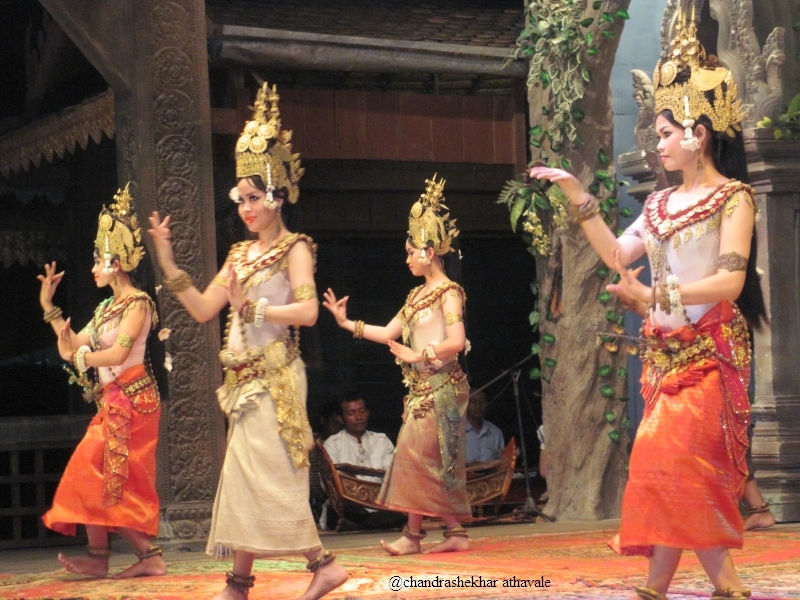 It originated from the Royal court dancers during reign of Khmer kings. During those days, the ballet performances were reserved for the king and his court. The art form was almost lost during the civil war. However after 1990′s , there has been a revival and formal training is given to the dancers in the School of Fine Arts in Phnom Penh. The dance form has 3500 defined movements with specific meanings. The story of the Ballet is usually about Cambodia’s origins or about a union between a hermit named Kampu and an Apsara named as Mera. I think that the story runs very parallel to the story of Sage ‘Vishwamitra’ and the Apsara ‘Menaka’ from the Indian scriptures. It is really a small small world, after all. The ballet performance is quite enchanting. 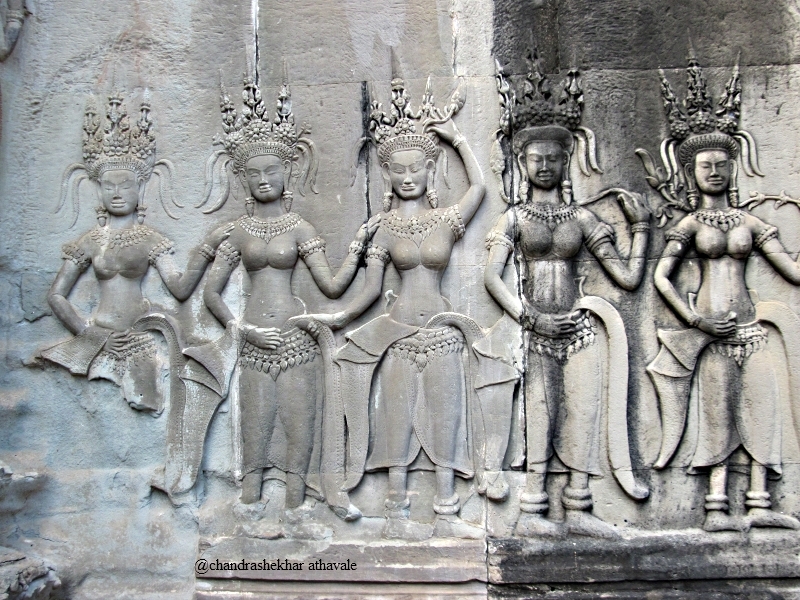 The attire of the dancers is very similar to the attire of the heavenly Apsaras, shown on the temple walls, except obviously for the bare part of the upper torso. The dancers wear crowns with intriguing shapes and are similar to what I have seen on the temple walls. The movements are mainly expressed through hands and facial gestures. 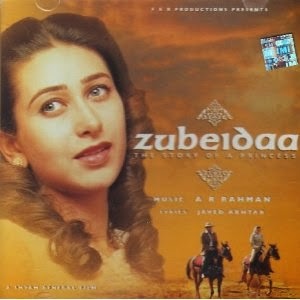 The musical accompaniment is distinctly different either from Indian, western or Chinese music. As I hit the bed, I feel greatly satisfied with the day. It has been a long day indeed. 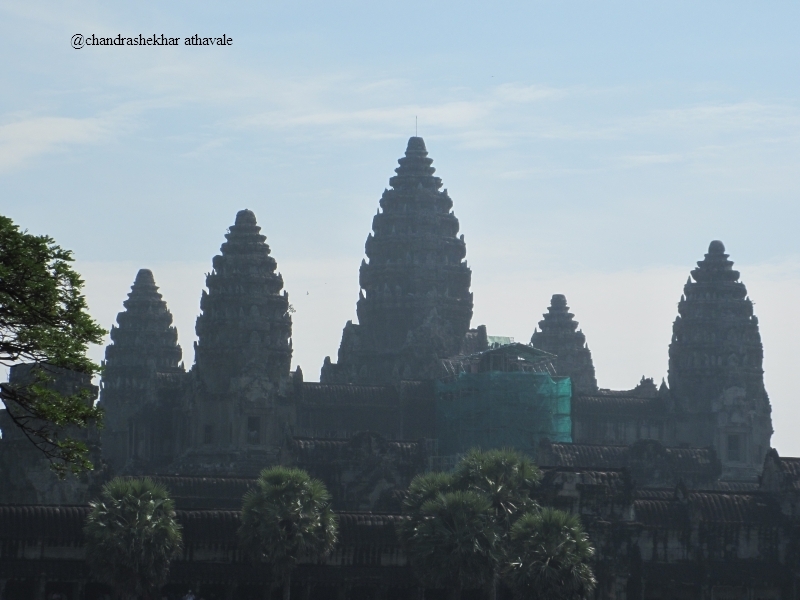 Tomorrow I need to travel about 30 KM away from Siem Reap, to visit the most beautiful temples of Angkor. 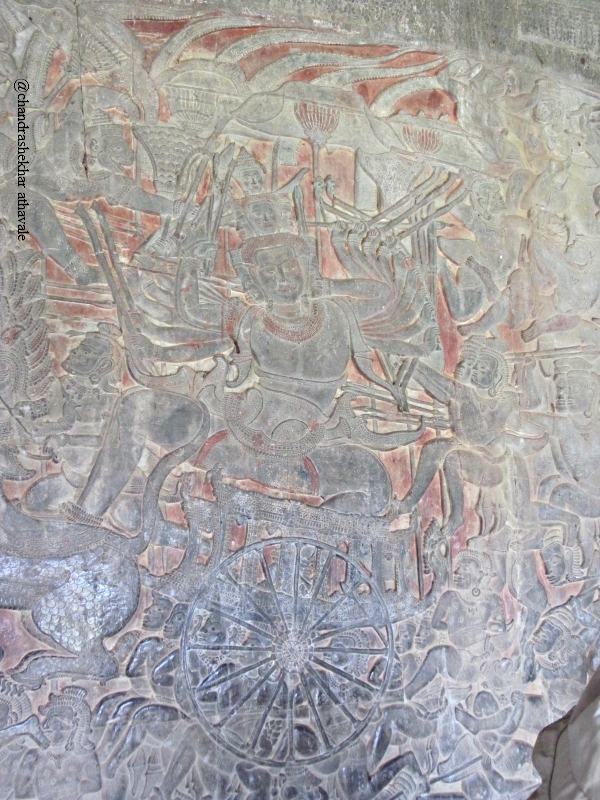 The temples of ‘Banteay Srei’.